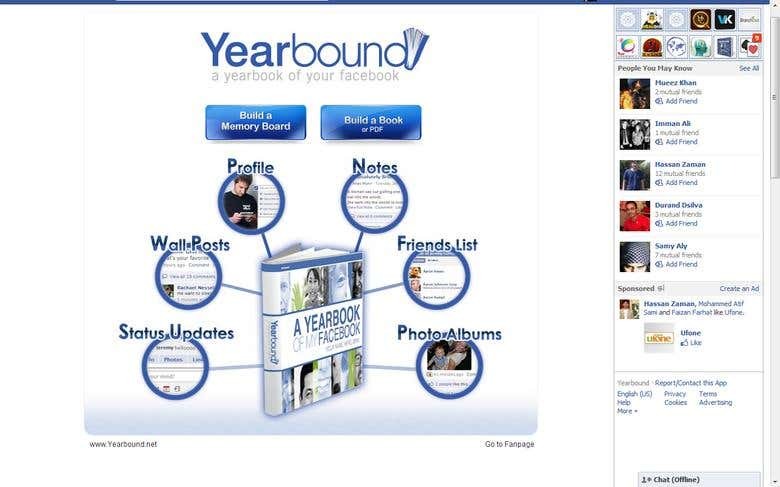 Yearbook of your facebook, Yearbound was developed using facebook Graph API to compile a book of facebook data for user. Key features: The application grabs all the selected facebook data by the users, including newfeeds, tag photos, album photos, notes, friends List and wall post, then generate html pages with css and jQuery to format them as a book page, and then converted into pdf book. Paypal was integrated as the payment gateway to purchase hardcopy of that pdf book. We are a web development agency having top expertise in JS (jQuery, AngularJS), PHP (Laravel 5 Experts), and C#. We've more than 100 satisfied clients and have top completion rate for all. Our areas of expertise are listed below. Skills: ======= - Expert in front-end development using JQuery,ReactJs, Angularjs - Ionic framework Experts for Hybrid Mobile application - HTML5 based interactive sites - Web based configurators tools - Flash to HTML5 and JQuery conversion - 2D canvas work (HTML5 canvas) - PHP (Core, Laravel 5, CakePHP, CodeIgniter, Smarty, Zend,YII) - API development, SOAP or RESTFUL based - E-commerce specialist (oscommerce, magento, zencart) - Facebook apps and fanpage development - Dot Net (MVC based development using C#.Net) - Database: PG, MySql, Sqlite, MongoDB - Repo: GIT, BIT Bucket Visions: high quality, high speed, high satisfaction!